I’m going to say it just this once, and then I’m going to leave it alone: dear, sweet, lovable husbands…get a clue!!!!!!!!! To be fair, this does not include all husbands, but I think the vast majority have no idea what kind of time, effort, and preparation goes into a dinner party. Even if it’s a casual dinner, there’s a measure of thought and toil necessary to pull it off. I’m not saying it was my husband who was the most recent offender…….but it was MY HUSBAND who was the most recent offender!!! OK…enough bellyaching about something that is just as inherent on his end as it is incomprehensible on mine. Given only about 12 hours notice and already beyond knee-deep in other tasks, this is the quick & casual fall dinner tablescape I pulled out of my… I created (and photographed just minutes before everyone arrived!). This is the way the table looked before I went into panic mode…my “regular centerpiece” just hangin’ out, mindin’ it’s own business, not hurtin’ anyone. No time for ironing a table linen! No time for creating a fabulous centerpiece…use the one that’s already in there (you’ve been looking forward to pairing plaid with paisley anyway! ), and just adjust it to make room for all the dishes. Rust-colored metal chargers work well as the foundation to this beautiful 222 Fifth “Maharana” paisley patterned dinnerware. I used a plain white Corelle salad plate to break up the color a bit and work with the white of the bowl’s center. 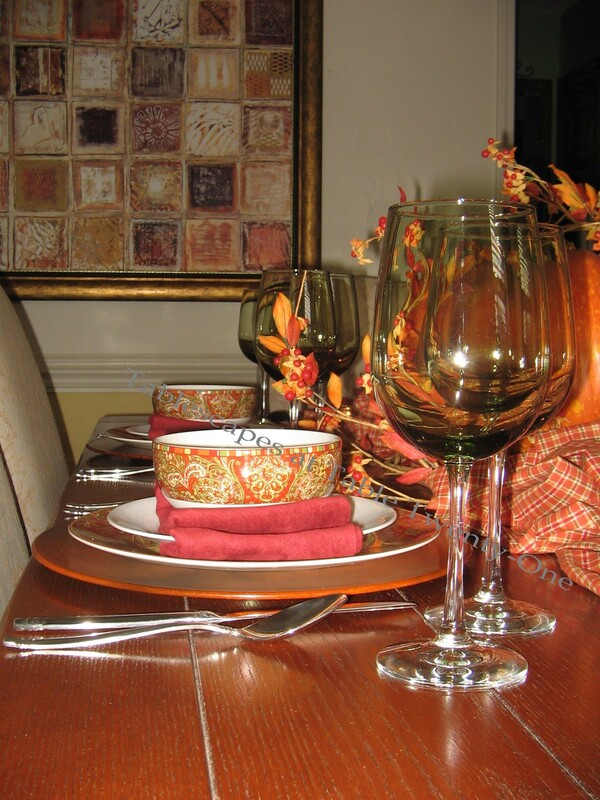 Using a bit of white or ivory helps to brighten your fall tablescape and prevent color saturation that can make darker tones seem to disappear into the table. 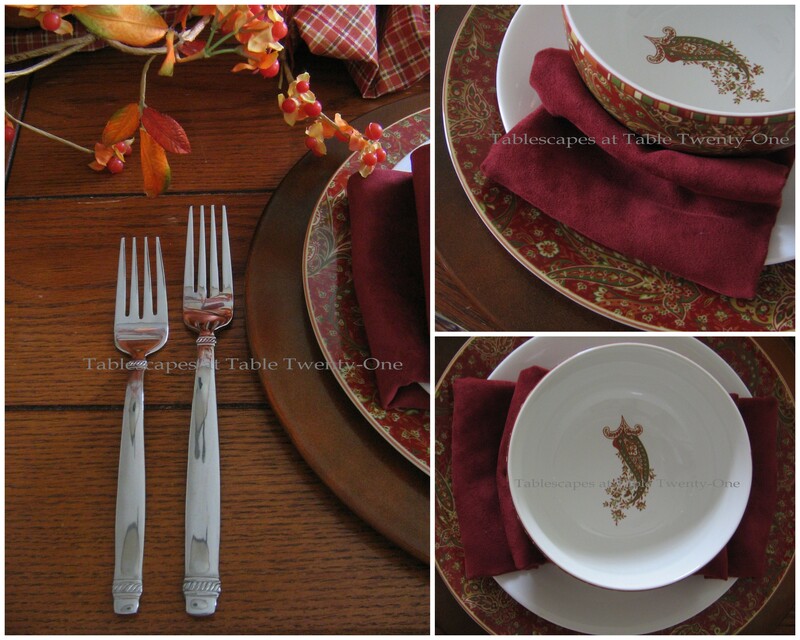 The burgundy brushed cotton napkins (Pier 1) are folded across the salad plate and “zhushed” on each side around the bowl just to make them look a bit more interesting. 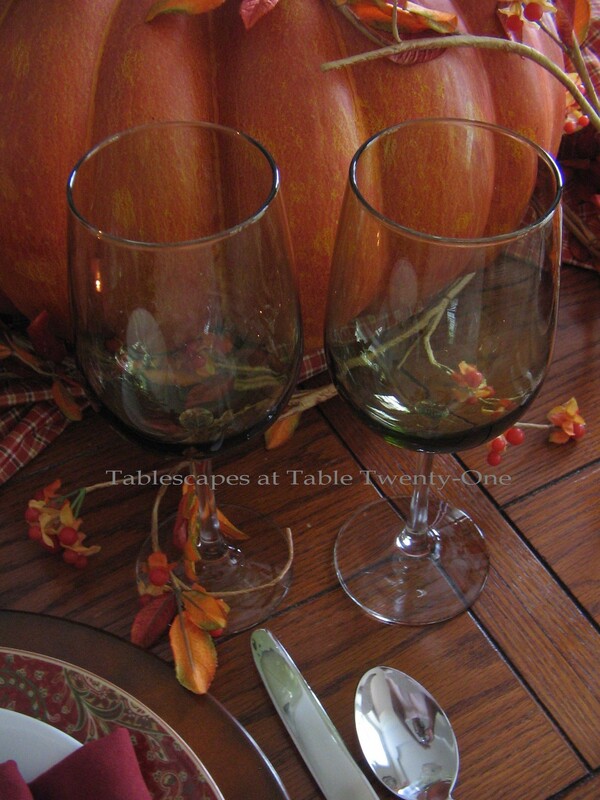 Olive green stemware from Dollar Tree picks up on the olive tones in the centerpiece fabric and paisley dinnerware design. A length of lightweight plaid fabric in fall shades of pumpkin, burgundy, olive and cream is carefully “zhushed” around a massive faux pumpkin. Faux bittersweet vine meanders around and across the pumpkin while a small smattering of votives provides ambient light. The votive candles on the buffet behind the dining table were already assembled from my tablescaping class earlier in the week, so I just left them there and served everything from the kitchen. (If all else fails, just design your room with tons of candlelight. Everybody looks good in the glow of it, and it adds a lot of pizzazz without a lot of effort!!!) 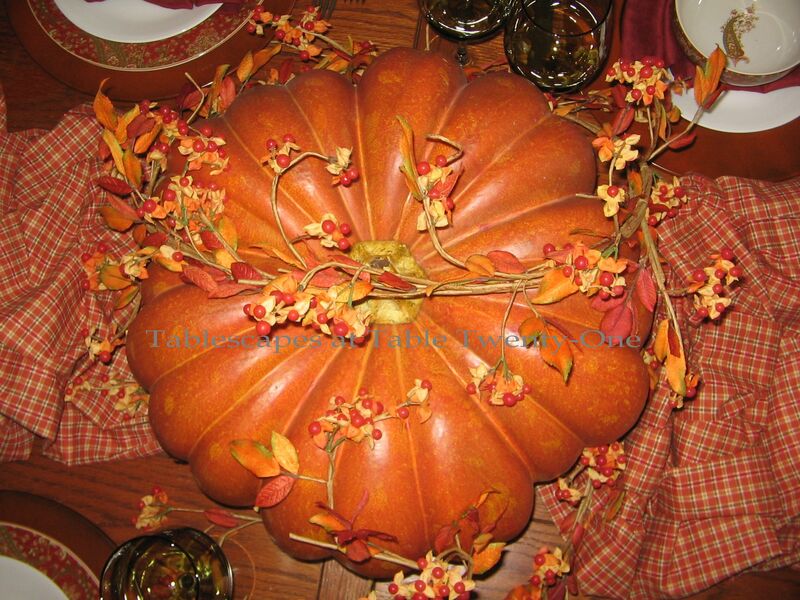 Pumpkins, also used in a classroom demonstration, are plopped down across the china cabinet and on the tea cart to add another touch of fall in the room. You still have about a week to sign up for my “Tablescaping a Winter Wonderland” class through Longview Community College. Click HERE for more information, or contact the Community Education Department at 816-604-2030. I am joining Cuisine Kathleen for “Let’s Dish!” starting at 6:00 p.m. CDT on Wednesday, the Style Sisters for “Centerpiece Wednesday“, and Susan over at Between Naps on the Porch for “Tablescape Thursday” staring Thursday morning at 9:00 CDT. 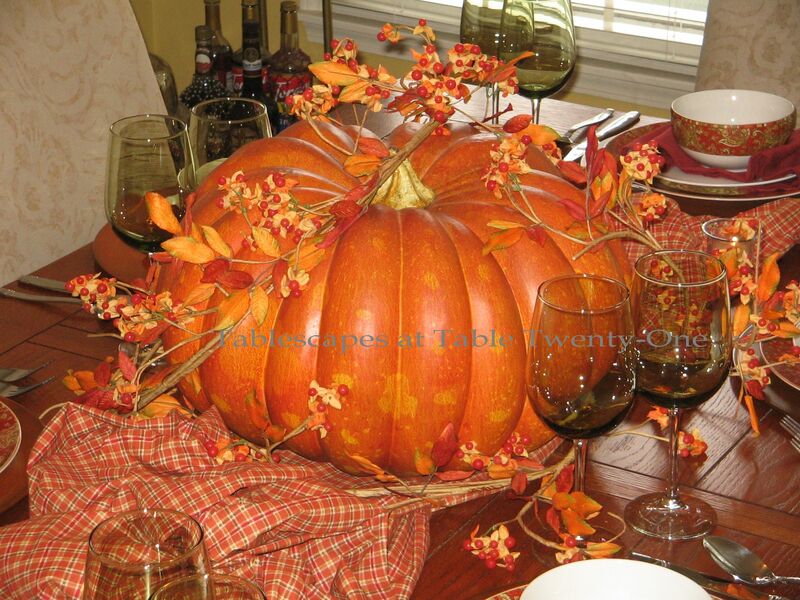 If you want to get an eyeful of great fall tablescaping ideas, join me! Alycia, you crack me up! I hope hubby has learned from this experience!! LOL!!! Well, for such short notice, I think, as always, you have done a fabulous job! I think you can pull off anything! Love those paisley dishes!! Girl you’ve got it goin’ on! Great job on a lovely quick casual table!! You did yourself proud, girl. You know you did! Costco some makes some great MRE’s that I wouldn’t mind serving to company! The husband thinks that is funny. There are entrees that when heated up in your own pots and pans and then presented beautifully on beautiful plates are probably better (or at least as good) as I could make anyway. Their roasted chicken put into the oven for an hour on low heat with a great sauce is unbeatable. Once again, you are amazing, Alycia! Talk about the hostess with the mostess! 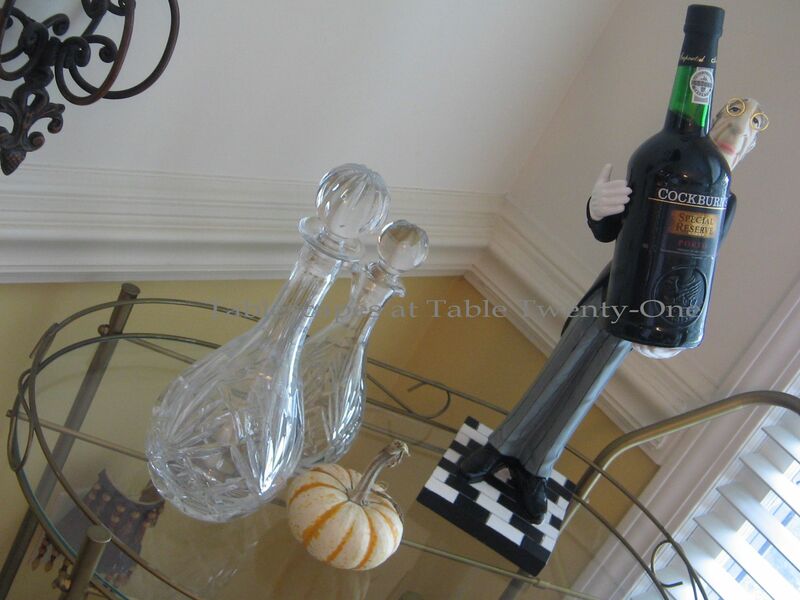 Your table looks wonderful, and I’m sure your guests were impressed. What faith your dear hubby has in your talents! I’m thinking that you ought NOT to be complaining about that prince you are married to!!!! He’s just helping you find opportunities to use all those goodies you have stashed about! I’m sure that since he is now enlightened, you can keep him appropriately terrified of you! If he does this again, serve beanie-weenie on paper plates and watch his horror! LOL…I’m glad you didn’t go on and on an on and on about your husband!! LMAO! Just kidding! I think you are in my head lately! I just decorated a large pumpkin with some leaves and berries and I also just put a scarf on the dining table with my big long basket!! I love how yours looks! You have such a good touch with fabrics and arrangements! Love the dishes and the charges. I’m on the hunt for some peweter looking ones. I definitely can’t afford the real thing! Well of course I love this table. Plaid and paisley what’s not to love! Very nice for pulling it out of your “creative place” ! Don’t we just love those men (sarcasm). I love the paisley dishes!! You sure can pull anything off, Alycia dear! 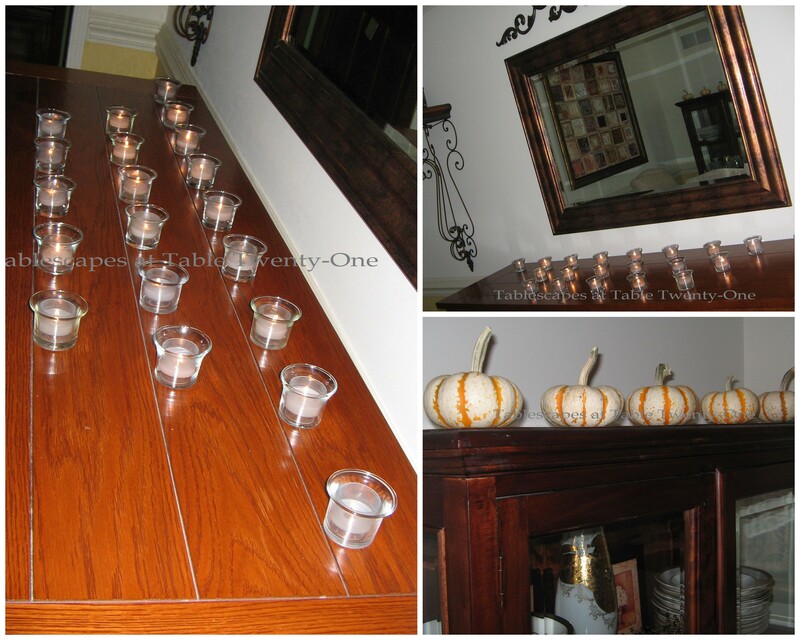 The plaid and paisley is wonderful and those votives sprinkled around the pumpkin just add the right ambiance. Great job as usual. You mean you don’t always do a table at the last minute? (: Somehow I think even if you were only given a moment’s notice, you’d come up with something special that made it look like you’d worked for hours. There’s certainly nothing not to like here and you made the hubby proud. You did a fantastic job but when don’t you??? LOL, at Ramon getting under your skin…he knows you will come through, Alycia! I love the paisley and plaid. I really, really like those dishes. 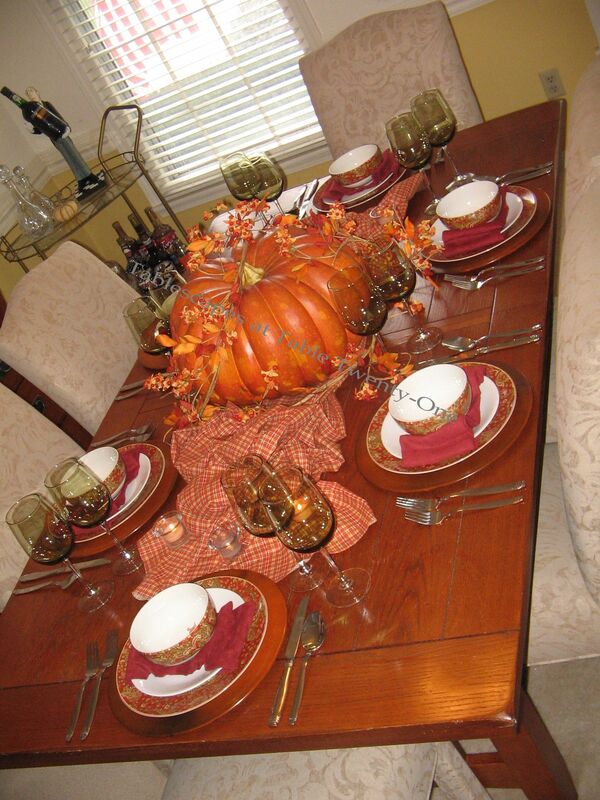 Great combination…..Ramon really got you…You can always pull off the most beautiful tablescapes, even in short notice. You are a real trooper. See, your hubby knows you. Great job! Alycia…….So so gorgeous!! Can I just come and live at your house all fall. I’d love every minute of it. And I know about husbands but… as mine has gotten older and matured with age he has come to realize the immensity of a dinner party and now really pitches in to help. (Thank goodness). Thankyou for sharing all your loveliness. I so enjoy all your talent!!! N.
If anyone could do it and do it well, it would be you. In addition, you were able to get photos. I would have been so rushed, I would have only thought of the pictures afterwards. The colors are wonderful and you make orange so elegant! Alycia, your table is beautiful as always. Love the paisley and plaid together. And you are correct, husbands can be a pain. I love it when I’ve prepared the whole dinner the day before, set a beautiful table, cleaned the whole darned house and he gets all the kudos for standing next to the grill for 20 minutes!!! You always amaze me!!! Just beautiful! Nothing about this looks thrown together or unplanned. Your hubby knows you are a miracle worker!!! This is so pretty. 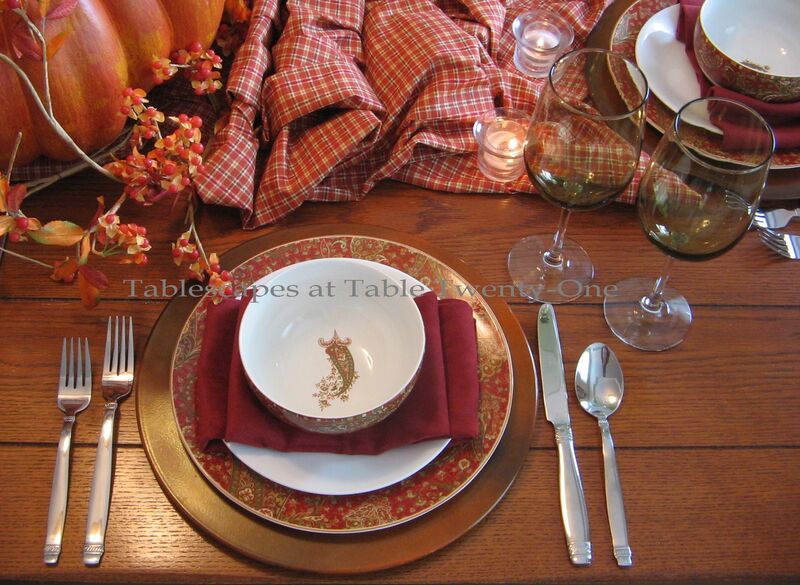 I love that paisley china and that big old fat pumpkin plopped right in the middle. What a great table….you work really well under pressure! I really make me laugh. Your centerpiece reminds me of mine this week and I have the same dinner plates you’re using! Excellent work for such short notice, Alycia. his is beautiful. I think your hubby just have a great faith in you cause he knows you can do it. And you sure can! 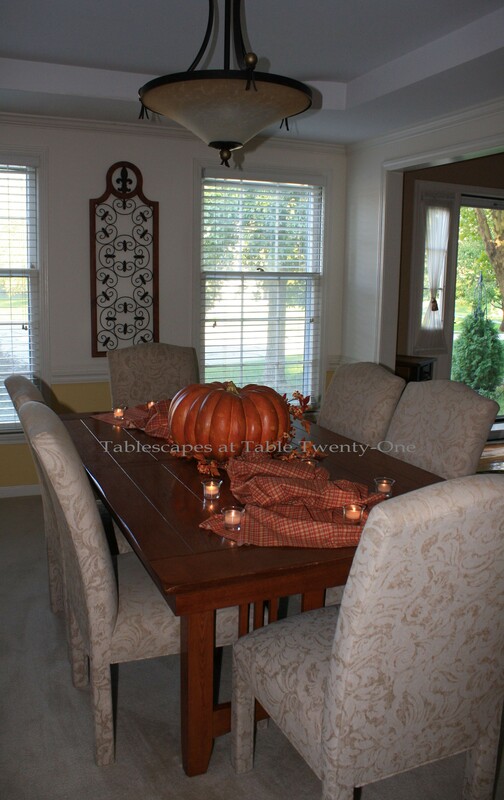 Love the paisley plates and that big fat pumpkin. Bittersweet says fall to me. 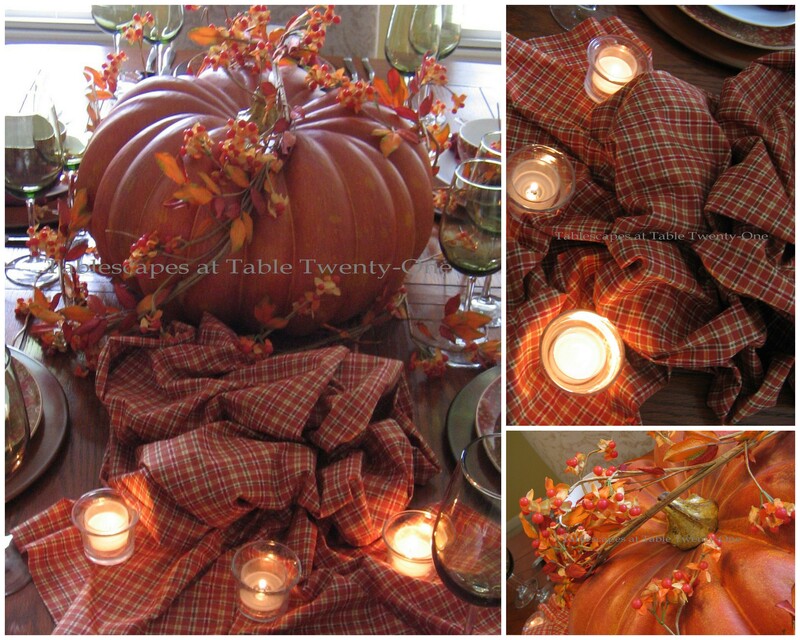 What a gorgeous tablescape, and you are amazing to have all that done in such a short amount of time–lovely! Alycia, you always put a smile on my face! I will remember your tips for putting a table together on such short notice. Love those paisley dishes, and you’ve reminded me that I need to pull out my paisley dishes soon! Have a nice weekend. Great table for a quicky. Love the plaid with the pumkin. Tell Ramon haha. Alycia, I have visions of your gooing flat out trying to pull this together!!! Well done! I hope you sat back and relaxed once your guests arrived. Now, there is something that Scott would not do…that boy knows that it would take us at least 3 days to clear the toys from every nook and cranny to allow any guests to even be able to walk through the front door without feeling the need to report us to the “hoarder’s” show! For such short notice, you have set a very beautiful table! I love the paisley dishes. 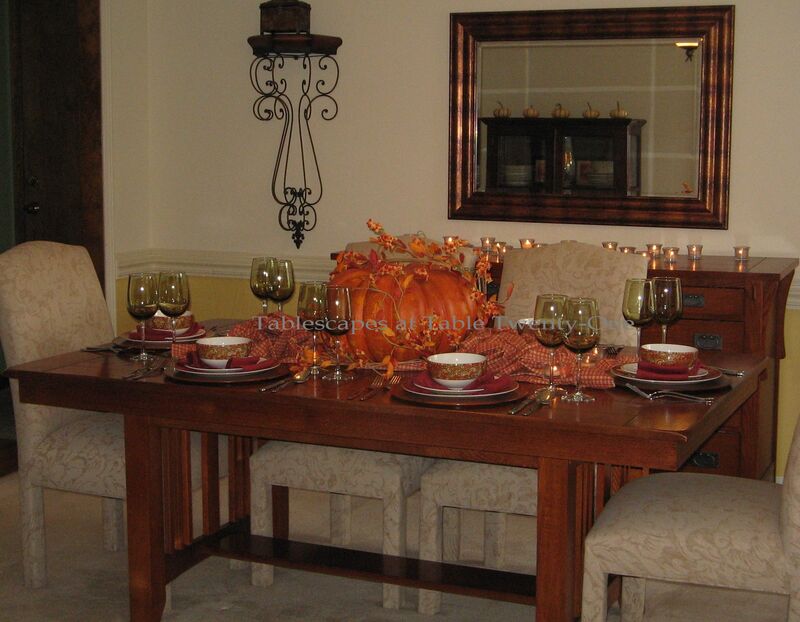 Perfect Fall table. Now that you have time to relax, tell Ramon to grill up that steak and wait on you hand and foot for the rest of the weekend! You deserve it. Hi Alycia: Just wanted to thank you so much for visiting my blog today–your comment made me smile and totally made my night! So glad that you liked my vintage bar cart! We are adding to the vintage feel in our living room with a victrolla cabinet that I painted–I hope to post this on Monday. I’ve been up to my elbows in paint and polyurethane for the last few weeks! Take care, and have a wonderful rest of your weekend!